Barry and Hayley’s special day showcased the benefits of a villa wedding in Spain. 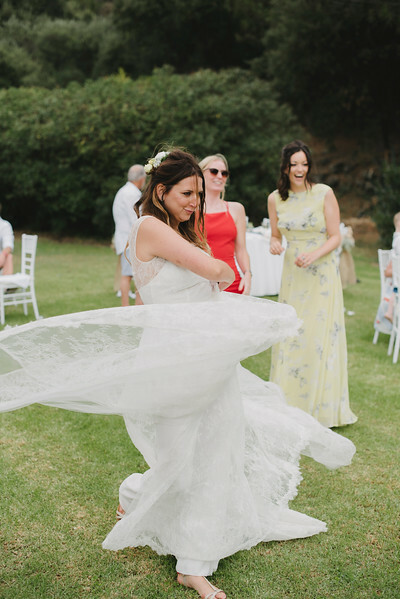 Baz and Hayley are a fun-loving young couple who had a very specific idea of how they wanted their special day to go down and the Sunshine Weddings team was delighted to turn this dream a reality. 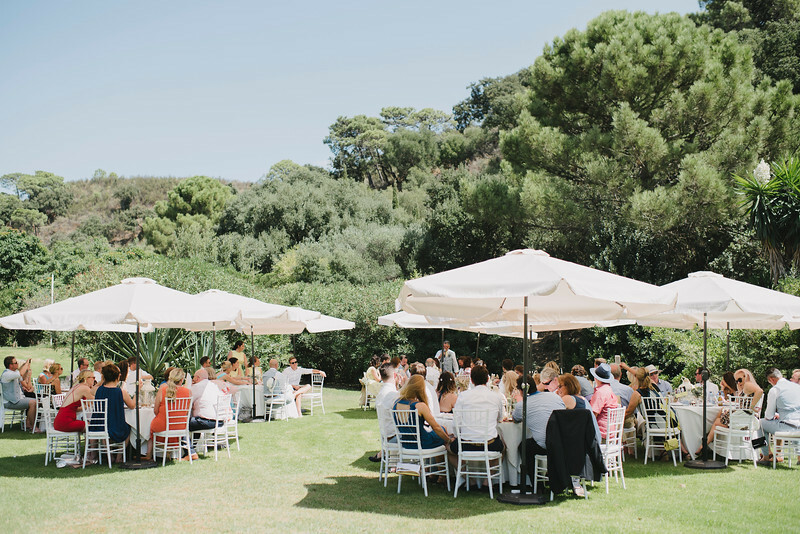 The couple booked their wedding venue, a villa in Casares, without seeing it. Brave? Yes! Worth it? Absolutely! 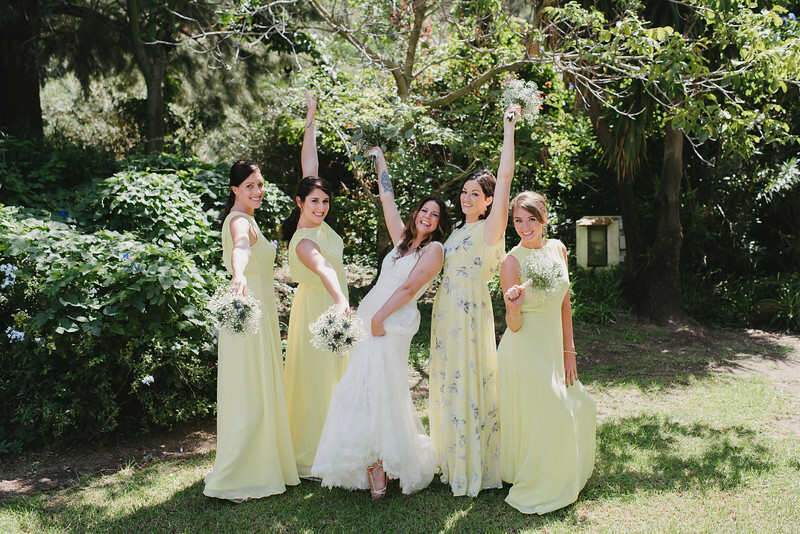 They had been looking for a venue where they could not only hold the ceremony and reception in the grounds, but also be able to enjoy a holiday with their family and friends. Situated very close to the famous authentic Andalusian white village, this villa was perfect for all their needs. Their wedding venue bordered the natural park yet was still only a 15-minute drive away from the most beautiful beaches. 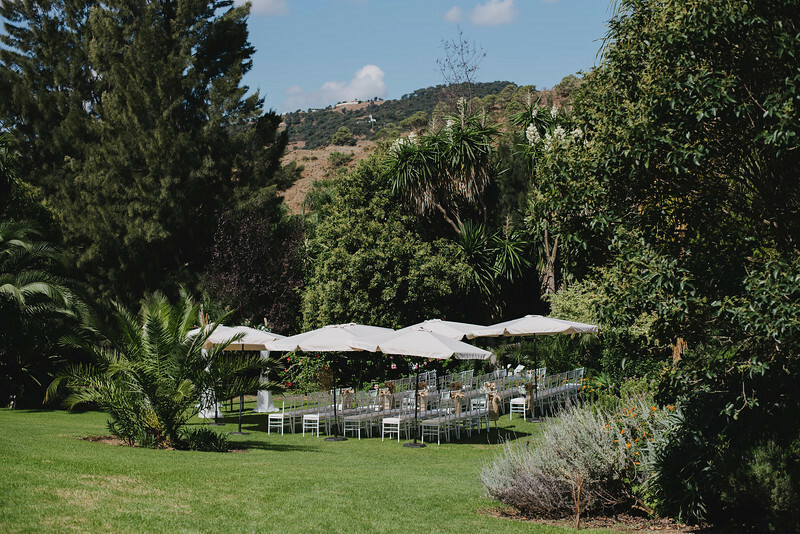 Set within a sprawling lush flowery garden with mature fruit trees and an enormous swimming pool gave them lots of scope when designing their wedding day. 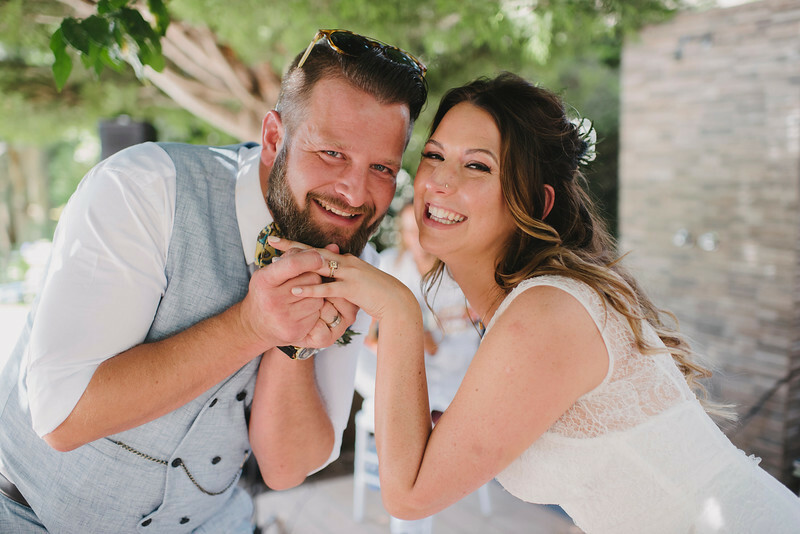 Scott first met the couple in Estepona Old Town, so he could get more of an idea of their style and vision for their big day. Baz and Hayley had hoped to see the villa during this visit, but as it had already been rented out, it wasn’t possible. They then returned in late April and enjoyed a fantastically productive trip (apart from the rare downpour of rain). “I will never forget Baz turning up in shorts, as you do and the rain hurtling down in the minutes we were not sheltered,” laughs Scott. By this point the Sunshine Weddings team had managed to sort out most of the wedding vendors, much to the couple’s delight. The only item not checked off the list was the entertainment after the wedding breakfast so, while Baz and Scott were chatting, the style of music he wanted became clear and Scott went straight to work. He found some videos and, in Barry’s term, had “nailed it”! Even better, Simone and Mike, who were the suggestions, were able to drop everything and drive to see them. There’s nothing better than seeing a good plan come together! The final piece of the jigsaw was placed over a gin and tonic and Simone and Mike were booked. As the couple had booked the villa in the week leading up to the August wedding, they were completely relaxed by the time the big day came around. While buses collected guests from Estepona, Hayley’s beauty preparations began in style. For the hair, Hayley opted for a loose, half up do, with soft waves to give more of an undone look. Our make-up artist, Nicola, created a soft bronze smokey eye paired with dewy, fresh looking skin for Hayley’s bridal make-up. Baz even sneaked in to get his tattoo covered up, making sure he would also be picture perfect. Hayley’s dress fitted her in every sense of the word. With a slight bohemian feel, it looked beautiful against her hand tied bouquet of wild flowers. The maids wore floor length, sherbet yellow gowns, and carried bouquets of gypsophilia. Baz wasn’t going to be outdone by the bridal party and looked super cool in his short-sleeved shirt, yellow bow tie, tailored shorts and waistcoat. The ceremony was performed by our comical Padre Peter and, as always, he had the guests in stitches. After the vows were taken guests enjoyed a cocktail hour by the pool listening to a performance by flamenco guitarist, Nano. After dinner it was time to party and let’s just say this crowd did just that; they broke records with our alcohol distributor BWS. Then it was time for Simone and Mike’s show, which took the party up to the next level. The Sunshine Weddings team couldn’t have been more delighted with Hayley and Baz’s wedding. It was a day filled with love, laughter, music, dancing and lots of bubbles. You can’t ask for more than that!